Two 10-Speed Weekend Special:Â The first is a 1974 Schwinn Continental in a brown not too often seen on bikes these days. The second is a rattle-can-black* Huffy cruiser. This special two 10-speed weekend is brought to you by Dave M.
I bought this bike from a friend of a friend for $15.00. It appears to be all original , except the tires. The 23″ frame is a little too tall for me so I don’t ride it much, but it’s only one of a garage full of old ten speeds that I ride a lot. The bike is a 1974 Schwinn Continental in almost mint condition. 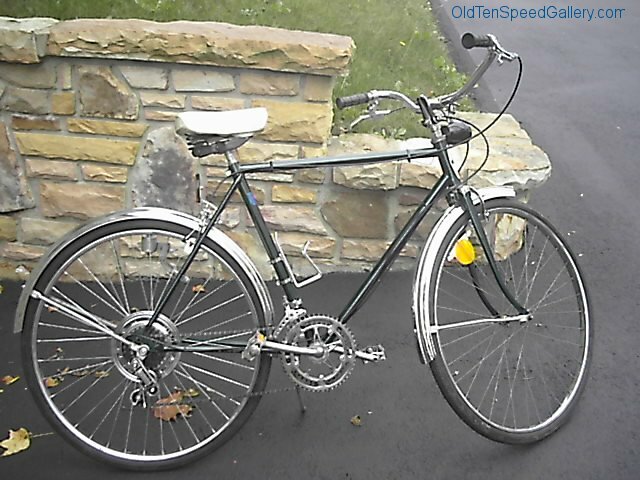 All parts are standard Schwinn approved, with the usual Continental upgrades. I love your site, keep,up the good work. Look for more pics in the future. I picked up a Schwinn Continental a few weeks ago at a thrift store (I won’t tell you what I paid but had to wait until they had their 50% day in the furniuture department . somehow they classify bikes as furniture . Fine with me. It looks like Dave’s 74 Continental with burgundy paint . Nice condition shiny chrome only a few chips on the top tube. Looks like it is original even the tires which have chickenpox on the sidewalls . I was planning to sell on craigslist afte I do my usual fixup . (oil cables and chain, true wheels so suicide levers work decently, adjust derailleurs and brakes , oil derailleurs and freewheel . Amazing how you can bring a dead freewheel back to life with a few drops of oil inside the body. But after reading some of the posts here on OTSG I was thinking maybe In should let other people retain what I might think are the crappy features that detract from my selling price. 2. Has a wheel powered generator ,probably original and fron and tail lights . All of this stuff is still shiny chrome . I usually just strip this crappy lighting system off and put it in the trash can . It’s useless for commuting at night . Like using a flashlight except it goes off whn you are stopped in traffic. I still would like to sell this bike for $250 or so to appease my wife who is upset with the junkifying of the yard and basement with to be restored bikes and wheels . Any opinions on keeping the old handlebar tape and lights or even whether I should put on gumwalls or just black tires. They cost me the same but the 27 X 1-3/8 gumwall tires give a nicer ride and less flats . Can’t get 27 x1-1/4 gumwalls anymore , i don’t think. 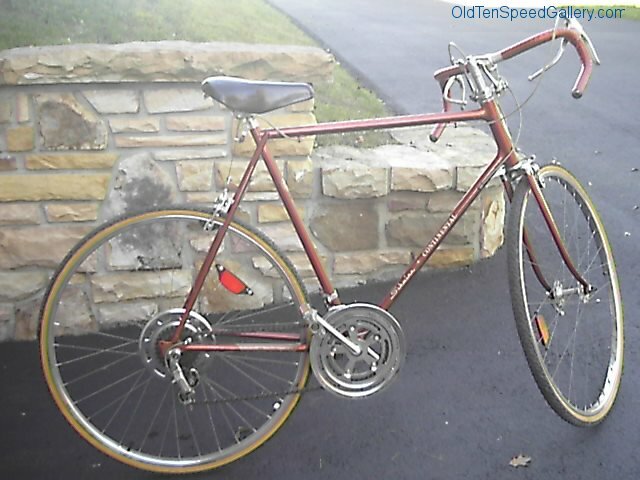 is your chestnut schwinn continental still for sale? Hi Dave, I have the identical 1974 Schwinn Continental in the chestnut color as you show here. I bought it when I turned 18 and still have it to this day. I recently bought a high-end hybrid and after riding it for a while, I went back to the 74 Continental and it still rides like a dream and for forty years it has always been kept indoors. I recently replaced the tires and tubes with the same Kenda gumwall tires (upsizing to the 1-3/8″ – hardly noticeable) and couldn’t be happier. The bike is a heavy-weight, and, for good reason. The frame is sensational. I still love the bike that set me back a ton of money at a very young age and has withstood the test of time.